Here it is! 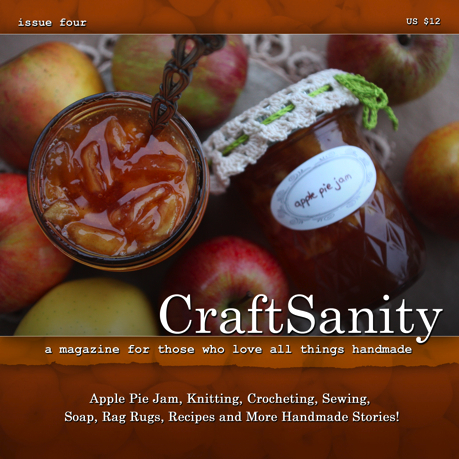 The Fall 2011 issue of CraftSanity Magazine is scheduled to hit the streets Sept 21 and I can’t wait to share it with you. From the apple pie jam on the cover to the other sweet recipes and crafty treats inside, this issue has a little something for everyone who takes a DIY approach to life. 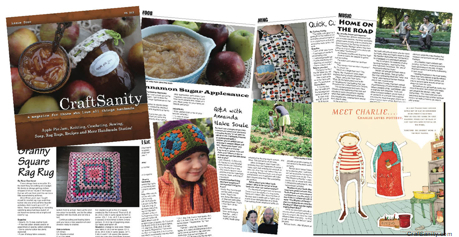 This issue features a whopping 20 projects, patterns and recipes to help you stay toasty warm this fall. I also sprinkled in some handmade stories and Q&As with emerging and established artists, crafters and a couple train-jumping musicians, too. • Whip up homemade soap and lotion and experiment with natural dyeing. You’ll also get to meet Charlie, the potter, the fourth paper doll in our series, find out why it’s awesome to stitch like your granny. that only myself and his boss celald him back in reference to the call ..that’s right, he did the same thing to his boss!Finally, Ajit, thank you for taking the time to share parts of our lives like this on your site, things like these are wonderful to look back on. Nu Andrei Chiliman a pornit aceasta criza, ci Crin Antonescu. Nu cred ca Andrei Chiliman ar trebui sa taca si sa inghita doar pentru linitea USL. Nu-i dau jos pe portocalii ca in locul lor sa pun PSD si PC, OK? The room turned out beautiful. My mom was just telling me great it looked. Thanks for showing us. Good job. Looks like it took some time. She is going to love it. Now you need to take a picture of the boys in their bunk beds. They are so much nicer than any of the shoes River Island are actually selling right now!! Thank you for sharing. Makes you wonder what other gems we miss because 'the masses' might not want to buy them. Love them! hello there and thank you for your info – I have definitely picked up anything new from right here. I did however expertise several technical issues using this web site, as I experienced to reload the site a lot of times previous to I could get it to load properly. I had been wondering if your web host is OK? Not that I am complaining, but slow loading instances times will sometimes affect your placement in google and can damage your quality score if advertising and marketing with Adwords. Well I’m adding this RSS to my email and could look out for a lot more of your respective interesting content. Make sure you update this again soon..